from near Couloir Peak and climbing the North Ridge to the summit. This is perhaps the least technical route on Mt Arrowsmith. Most parties reach the head of Moses Creek via Moses Rock, a domed bluff sitting on the true left of the creek. Moses Rock can be reached from the Lawrence Valley via various routes, but most commonly by following a scree gully immediately south of a patch of scrub about 1250 metres south of the creek draining the south side of Moses Rock. Aim for Pt 1646 metres, then traverse north to the flat plateau above Moses Rock. From here, climb the glacier at the head of Moses Creek. The upper section of glacier can be reached by either a steep snow ramp (a rock step with rock fall late in the season) or by climbing to a small col on the ridge south-east of Pt 2319 metres. Once at the col, drop northwards over the ridge to sidle around the steep, lower part of the ridge, then head eastwards onto the crest of the rock ridge and from here gain the upper glacier. The upper glacier provides access to various gullies and loose rock ribs which lead to the North and South ridges of Arrowsmith. Follow the ridge (exposed in places) for the final few metres to the summit. 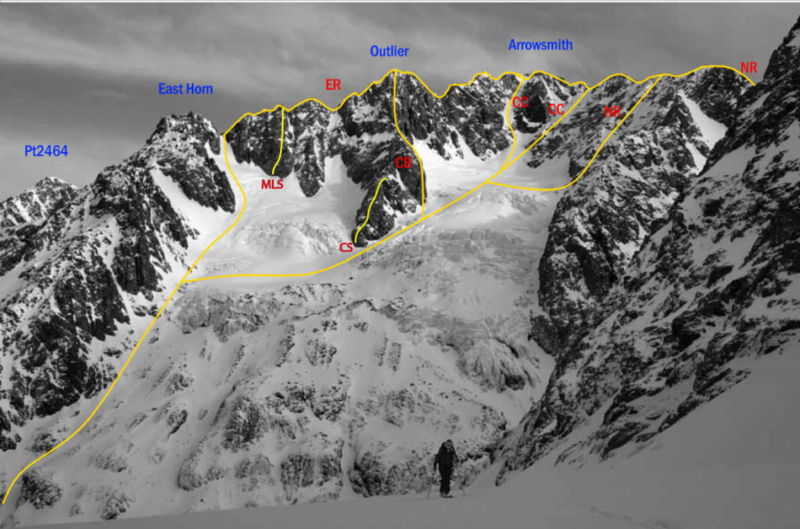 The South West Ridge can be traversed from Ashburton Peak to the summit, turning two gendarmes on the Lawrence side. Alternatively, the ridge can be reached directly from the Hakatere River via snow slopes and small glaciers. This is a snow and ice climb up a broad snow face followed by one of a number of gullies to the summit of Mt Arrowsmith. From the moraines at the head of the Hakatere River climb to the schrund at the bottom of the Ashburton Face. Climb a short, steep section alongside a steep rock rib to gain the slope above. Climb until a small arête is reached, and from here either go left to snow slopes and gullies that join the South West Ridge, or head up steeper rock directly to the summit. Usually in condition only from late winter to early summer, and subject to rock fall. Right-hand side of Ashburton Face. Snow and ice climb with several short mixed sections. FA: unknown. Kyle Walters, Michael Eatson October 2018. A long route when attempted via East Horn, the first half of which is on poor rock. Alternatively, reach the ridge via the South Cameron Glacier, climbing steep snow slopes to a col of rotten rock on the East Ridge. A schrund 60–70 metres below the col may be passed on rock on the left. Climb along the narrow ridge crest to reach the big outlier to the east of Mt Arrowsmith. Climb the outlier on a wall of good rock, then scramble down and along the ridge on loose rock to a rotten, narrow col. From here a steep section of friable rock leads to solid slabs and cracks and then up three rock steps to the summit. This route follows a series of good rock slabs, with two pitches up to grade 14, on the prominent rock rib rising out of the South Cameron Glacier. Climb the second buttress, avoiding the toe of the ridge, and top out on the main outlying peak on the East Ridge. This route provides good access to the best (final) part of the East Ridge. Scramble first 100m until you get to a short crux of possibly grade 16, then pitches ranging from 10-14 until meeting up with the Cameron Buttress route. This is a direct route from the South Cameron Glacier that follows the main couloir to the summit. It was the original descent route but is now the most common route to the summit. In good snow conditions the climb is straightforward, but if snow is thin at least two major rock steps may need to be negotiated, usually on the broad ledges and short walls to the right of the couloir, and this will increase the grade of the climb. Once on the summit ridge scramble around on the Lawrence side to the summit. The couloir is prone to bombardment from rock and ice debris and usually is not a late season route. A second couloir, 200 metres further north along the ridge, is also useable. From the South Cameron Glacier follow moderate slopes, which lead to at least two snow gullies that provide access to the North Ridge. Scramble along the pinnacled ridge turning the last gendarmes on easy ledges on the Lawrence side. 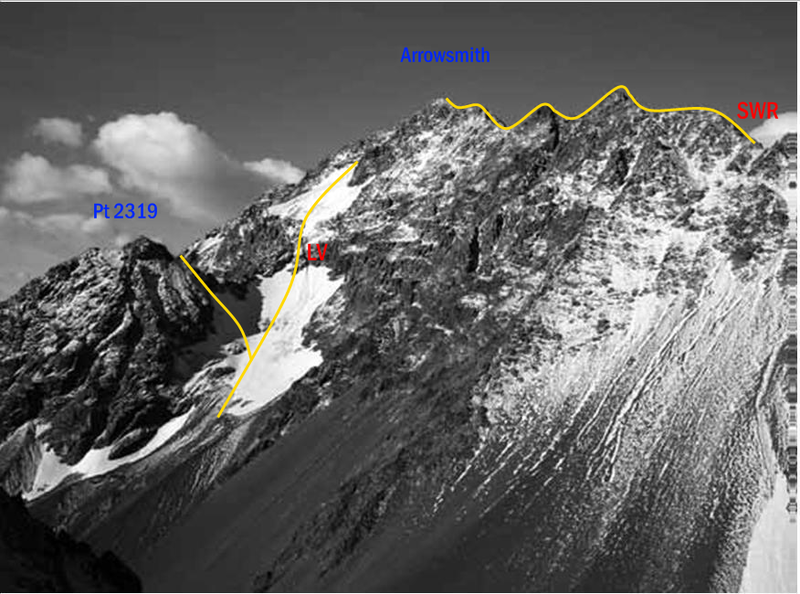 The full North Ridge can be reached from Cameron Col and involves a long day’s scrambling, exposed in places. Initially good progress can be made on the Lawrence side, but once forced onto the ridge the numerous towers are time consuming. Ascends the East Face of Outlier Peak on compact sandstone with excellent protection. Six pitches plus scrambling. Crossing the bergschrund at the base of route can be problematic. Pitch: 1. (19, 20m) Ascends prominent crack system immediately right of large roof. Climb overhanging corner to ledge. Make large traverse left underneath roof to pillar (micro-cams). Ascend open book corner to belay ledge (Camalot #4). 2. (18, 50m) Up open book, right facing corner, through small roof and onto slab. Traverse slightly right and through the overlap. Continue up easing ground to belay. 3. (12, 70m) Scramble easy ground, trending left to large ledge with snow. 4. (17, 50m) Steep (hand to fist) crack through several bulges to good ledges. 5. 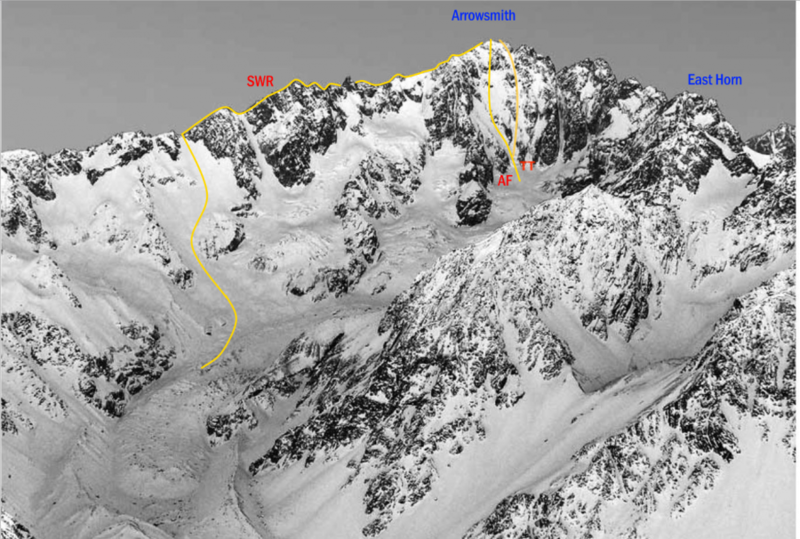 (10, 80m) Scramble easy terrain, trending left belay at base of prominent summit headwall. 6. (14, 80m) Crack systems on left side of summit buttress, deteriorating rock quality. Descent: Via the Cameron Buttress Route to the large saddle (1x 30m Rappel). Downclimb (upto grade 10) slabs to the top of the 4th pitch. 1x 15m and 1x 30m rappel to the snow covered ledge. Starts directly beneath large overhangs. Pitch: 1. (17, 50m) Follows obvious right trending flake system to a large ledge. First 5 meters is loose and dusty but the protection is solid. 2. (18, 45m) Pull through steep bulge off the ledge and trend left up corner to a ledge. Continues directly up left facing corner (ballnuts, microcams) using small incut edges. Glorious committing climbing. 3. (15, 50m). A long left-traversing exploratory pitch, before reaching a small overlap with a good belay ledge above. Plenty of scope for variation. 4. (14, 30m) Straight up corner, gradually easing to scrambling. Protection: Excellent: Camalots (#00- #4), 1 set of Wires. Ball-nuts (1 & 2). 2x 55m ropes. Descent: 4 rappels (upto 55m), all bollards. Used approximately 6 meters of cordelette. Tawny Wagstaff, Laudi Olijve, Michael Eatson. Feb 2016. A good route and much easier than initially expected. Starts left of the central slabs. Pitch: 1. (16, 50m) Climb out of the 'schrund up left facing corner to obvious hand crack on face. Step right around corner at horizontal feature, then back left to avoid roof. Belay in diagonal groove. 2. (16, 45m) Continue along grove aiming for the top right corner of roof to belay. 3. (14, 40m) Through roof onto face and up to belay in large blocky corner. 4. (15, 60m) Follow prow to the top. Plenty of variation exists. Michael Eatson, Tawny Wagstaff, Trev Ponting. April 2016.
any idea when routes on Mt. any idea when routes on Mt. Arrowsmith will be added to database? I've heard that it's pending due to CMC rights. Are they going to be added at all?